The network’s half-day workshop at the Laing Art Gallery in Newcastle explored North Eastern portraiture production and collections from the 17th century onwards, as well as various approaches to portrait interpretation. On this page you’ll find synopses of the presentations. Anne focused on a series of key questions relating to regional portrait production, such as how did prolific regional centres, for example Bath, York and Edinburgh, develop? And was there, correspondingly, a ‘Northern school’ of artists at work in the 17th and 18th centuries, based in Newcastle and other regional centres? And if not, why not? From these issues Anne explored the social, political, economic and educational conditions which affected the careers of aspiring artists in the region, and which finally gave rise to the beginnings of a local school in the very late 18th century. An overview of the surviving portrait collections of a selection of Northern gentry, such as the Ords, Ridleys, and Charltons, and the ecclesiastical collection at Auckland Palace, aimed to uncover contemporary patterns of patronage. It revealed a combination of the use of London’s premier artists (Gainsborough, Reynolds, Romney, Hoppner, Kaufman etc. ); foreign commissions from artists working in Rome such as Pompeo Batoni and Nathaniel Dance; works by identifiable regional artists (the 17th century amateur Sir Ralph Cole and, much later, William Bell and George Gray; and occasional commissions from peripatetic artists visiting the region, notably Thomas Bardwell, Philip Mercier and Francis Lindo. In addition, Anne showed images of a considerable number of unattributed works in local collections by artists of some technical competence, but evidently lacking a London training, as well as works by anonymous, presumably local, artists whose work is often somewhat naive, and suggests a perfunctory training. By the turn of the 19th century, local artists, several of whom had trained at the Royal Academy schools in London, were returning to the region and managing to sustain their practices, which typically encompassed a range of genres, including portraiture. Peter evoked the competitive atmosphere of the ‘head-to-head’ portrait painting demonstration staged at Newcastle’s Central Exchange Art Gallery between Ralph Hedley (1851-1913) and John Dickinson (1825-1908) in November 1879. The event was directly inspired by the visit to Newcastle and Sunderland earlier that month by the French artist Alphonse Legros (1837-1911); in Sunderland Legros had painted the portrait of Thomas Dixon (1831-1880) as a homage to the bibliophile and art lover. 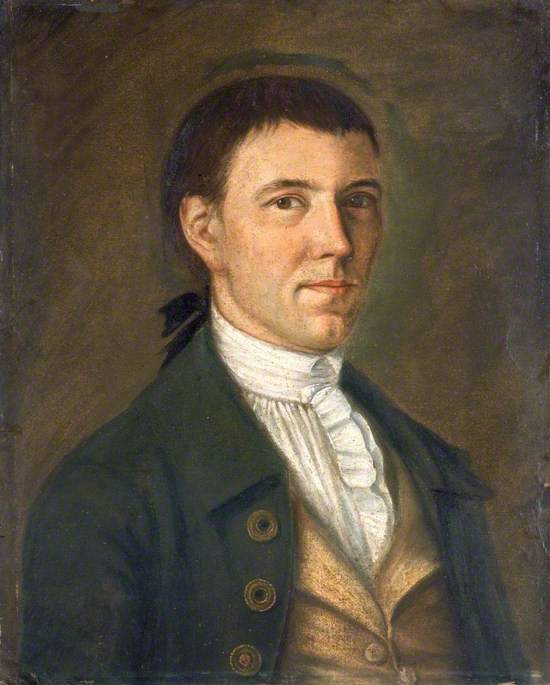 It was clear that such local enthusiasm for portraiture was sporadic, as contemporary artists such as William Nicholson (1781-1844) and Henry Perlee Parker (1795-1873) struggled to survive professionally, while being tempted to gravitate towards the more reliable patronage centres of Edinburgh and York. Amidst the ongoing argument over the paucity of local support for aspiring and practising portrait painters were a variety of success stories; William Bell Scott (1811-1890) was master of the government-run school of art in Newcastle, playing an important role in fostering art education in the locality over a period of twenty years. Bell Scott’s large mural scheme at Wallington (now National Trust) draws on key episodes of Northumbrian history for which the commissioning family, the Trevelyans, provided the models. In the late 19th century, artists of the Bewick Club (founded in the 1880s, and named in honour of the eminent Newcastle engraver Thomas Bewick (1753-1828)) made a virtue of ‘staying at home’: its artist members practising in the North East inspired by French realist art then in vogue. For example, in 1880 Henry Hetherington Emmerson (1831-1895) painted Lord Armstrong in the Dining Room at Cragside. Emmerson marshalled a number of the pre-occupations of the day to present us with a portrait of the art collector and arms magnate as man of the people, living in a small cottage, extolling the virtues of home, and comfortably at rest. Marie-Thérèse summarised the various collections within Tyne & Wear Museums, focusing on the formation, evolution and remit of each. The highlights of the portrait collections were explored, revealing key examples by local, national and international artists. Marie-Thérèse explained the current acquisition programme, which aims to incorporate high quality contemporary portraits, such as Chris Ofili’s Untitled watercolour series of 1998, and Andrew Tift’s topical Welders and Changing Face (1994-95). Tyne & Wear Museums has also hosted the travelling BP Portrait Award and Taylor Wessing Photographic Portrait Prize, as well as other initiatives in collaboration with the National Portrait Gallery and the North East Regional Museums Hub. Finally, a selection of the exhibits in the forthcoming portrait exhibition Beyond the Image were shown, which draws together a range of extraordinary sitters and characters (portrayed by Philip Connard, Frank Auerbach and Rineke Dijkstra, among others), and local artists such as Henry Perlee Parker and Ralph Hedley; revealing the personalities behind the pictures (Laing Art Gallery, 25 April to 21 June 2009). Clare showcased a host of inspiring learning aids for interpreting portraits with a variety of audiences. These were all tried and tested in recent portraiture exhibitions at various local authority museums and galleries, and are currently in use at Beningbrough Hall near York, which houses highlights from the National Portrait Gallery’s 18th century collection. All the tools aimed at ‘building a bridge’ between the visitor and the portrait collection, and enhance generic interpretive skills can be applied elsewhere. Learning aids can encourage the viewer to explore and consider specific aspects of portraiture, such as pose, props, costume, symbolism and narrative. Clare explored the purpose of various different learning tools, such as jigsaws, masks, costumes and more high-tech options, including the practical pros and cons of each. For an in-depth discussion of these issues, see Clare’s online toolkit here.